​Wednesday, February 6, 2019 at 5:00p.m. This is a rare chance to hear two authors of important Flint history books -- Lawrence R. Gustin and Kim Crawford -- at the Totem, 620 W. Court St. (across from the White Horse restaurant). Both writers are members of the Genesee County Historical Society. There is no charge for the program. 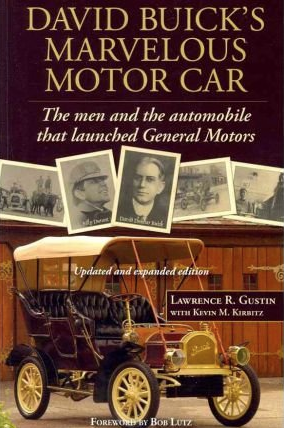 Larry Gustin, rarely a speaker, will discuss his "final special edition"of "David Buick's Marvelous Motor Car," subtitled "The men and the automobile that launched General Motors," which was published in 2018. Among new features are words and pictures about the newly restored Durant-Dort Factory One, where GM founder Billy Durant and his carriage partner, Dallas Dort, first built horse-drawn vehicles in the 1880s. New GM President Mark Reuss led the drive to restore that building, just across the street from our Durant-Dort Carriage Co. office, which is Flint's only national historic landmark. The new edition also features Gustin's eight-page remembrance of Charles Stewart Mott, who Gustin interviewed for his 95th birthday a half-century ago. A limited number of new copies are available for sale. The Billy Durant and David Buick biographies are critically acclaimed award winners. At age 81, he says he's unlikely to add to that list. Larry will also briefly discuss his other books, "Billy Durant, Creator of General Motors" (1973, updated for GM centennial 2008), "The Flint Journal Centennial Picture History of Flint" (1976-77) and "The Buick: A Complete History" (co-authored with Terry Dunham, 1980, five updates through Buick's centennial, 2003). A few of the updated Durant books will be available Jan. 30. Gustin was auto editor and assistant metro editor during 23 years at The Flint Journal and then assistant public relations director during a 21-year career at Buick, retiring in 2005. Kim Crawford, who retired after 28 years as a reporter at The Flint Journal, has written the first biography of the fur trader who became the first white settler at what would become the Flint River community -- Jacob Smith. Kim has also written books about Michigan soldiers in the Civil War. This is an unusual opportunity to hear Kim talk about his book, "The Daring Trader: Jacob Smith in the Michigan Territory," the long-awaited biography of a man who spent much of his life in the forests and on the lakes and rivers of Michigan, and whose life has now been fully explored for the first time. Both Larry and Kim will be available to answer questions.